Here we are at the end of April. I only made it through 20 days of writing a poem a day. More thoughts on that later, perhaps. I'm trying to feel good about the poems I have that I wouldn't have had if I hadn't been writing a poem a day. I'm trying not to feel bad about how many times I had to resort to haiku. I'm trying to think about the fact that I got some manuscripts in the mail, and that's valuable too, even if I wasn't writing poems this week. I will likely post my book give away results a bit later than everyone else. I'm away for the week-end and my computer access will likely be limited. But I'll post results on Monday, if I don't post them earlier. There have been several posts this week that have set me to daydreaming, even during a hectic work week. I thought I'd mention them, in case you're in need of inspiration too. Susan Rich talks about her book launch party and reading here. It's great stuff, especially if you are new to the world of poetry readings. I'm particularly intrigued with the idea of having party favors that tie in to a poem in the collection. I've spent some time mentally going over the poems in my various manuscripts and wondering what might work. Or maybe I should write something new, with a heavenly component (Susan gave out violet scented chocolate), something so swoon-inducing that people will forget to take pictures. I also like the idea of giving out a door prize. And I really like the idea of having a few printed poems for people. People want to be able to concentrate on our poems, but many of us do better with some printed words in front of us. For more pictures and comments, head over here to Kelli's blog. While you're there, you might wander to this post, which has some interesting thoughts on what makes a good poem. It could make a great mini-lesson plan, for those of you who need to teach and find your wells running dry. Elizabeth Adams has a great post on social networking here. I, too, have a love-hate relationship with all these networks. I've enjoyed being back in touch with old friends and making new ones. But I miss the old-fashioned networking, where people would have a meal together. I read about poets who get together for a day of poetry writing and good food, and I weep with missing some past times of my life, where we all had a Saturday we could devote to quilting and fellowship. April turned out to be a more hectic month than I anticipated. This past week has been the kind of week where I've been grateful for meetings that included lunch. Once I would have turned my nose up at a sad turkey sandwich. These days, I'm grateful, because I haven't had time to cook a delicious pot of something wonderful to bring to lunch. I find myself snagging the leftover lunches because I know the meeting group has already paid for the food which will likely be thrown away. Yes, my life has come to this. So, once I get back from my week-end trip, it's time to set some priorities. More home cooking. More vegetables. More face time with friends. I'll settle for online messages and box lunches, but they won't sustain me forever. I've been fascinated by the e-mails written by the Goldman Sachs executives, especially VP Fabrice Tourre. Anyone who invents a moniker for himself (and it's almost always a guy) is suspect in my book. Fabulous Fab? Give me a break! A brief mental detour while I wonder what moniker I would create for myself. Alas, as I learned long ago in getting to know you exercises at camp, there aren't many adjectives that start with K. Kind Kris? Not exactly on the same level as Fabulous Fab. And this morning, in E.J. Dionne's column in The Washington Post, I read about this man's e-mails: "The ever-more-complex financial instruments are defended on the grounds that they make life better for everybody. Tourre offered this justification in another of his revealing e-mails: 'Anyway, not feeling too guilty about this, the real purpose of my job is to make capital markets more efficient and ultimately provide the U.S. consumer with more efficient ways to leverage and finance himself, so there is a humble, noble and ethical reason for my job ;)' Then he added: 'amazing how good I am in convincing myself !!!'" Ah, hubris. Do these men never think about how all this will sound when their private writing becomes public? And it always becomes public. I'm reminded of Senator Packwood, the indiscriminate writer who served as a lesson a generation ago. He was forced out of the Senate in the 90's, once his journals revealed that his behavior was indeed suspect, and likely criminal. At least a private journal might remain private, although elected officials should not assume that. But I've become convinced that we don't have much private life anymore. E-mails are never private. Cell phone calls are easily intercepted. In major cities, one is always being filmed. When I commuted to Miami in 2001, I was shocked to realize how many cameras were on my route. Granted, they were primarily used to keep an eye on traffic. But I felt weird. Now it just feels normal. I lead a boring life, so I'm not too worried. Maybe Fabulous Fab thought he didn't need to worry either. Of course, I'm not making major deals that can blow apart the economic life of our nation. No government agency will subpoena my private journal because of my provactive poetry. Even if we did move towards a McCarthy-esque time when artists weren't safe, I'm not sure my poetry threatens the nation; of course, most of those blacklisted artists would have said the same thing. Interesting, though, to think about how one's words might come back to haunt one. It took me a long time to start blogging, because it felt so public. I still don't know whether or not this blogging would come back to haunt me if I had to find another job. So far, it doesn't seem to have much impact on my current job, so I suspect that it wouldn't have much impact on future job searches. I'll suffer far more impact from the fact that each year, more people earn Ph.D.s and each year, more jobs vanish. Today is Carolyn Forche's birthday. In this blog post, Charles Jensen asks, "Is anyone in my generation not indebted to 'The Colonel'? If not indebted, can any of us write without acknowledging it or understanding its importance?" I'm not going to paste the poem here, since it's not mine to post. But you can find it here. I love this poem, and it's a joy to teach. For one thing, it launches an interesting discussion about what a poem is. I've seen this poem in an anthology of short, short fiction, and most of my students say it reads more like a snippet out of someone's journal. It probably reads that way because in some ways, it is. Forche herself says, ""People have interpreted many features of this poem, but when I wrote it, I was just trying to capture details so that I would remember. I didn't even think it was a poem. I thought it was a piece of a memoir that got mixed up with my poetry book" (The Language of Life, page 135). This poem is probably her most widely anthologized poem, in fact, the only one of hers that I've ever seen in those anthologies that most of us use in our first year Lit classes. I've often wondered how Forche feels about that fact. I imagine her saying, "But I've written so many other poems. Some of them are much better." Or perhaps she's happy that a poem of hers has stayed in print and in our consciousness over 30 years after it was first published. I would be. I am most deeply impressed by her collection Against Forgetting: Twentieth-Century Poetry of Witness, her anthology that collects poetry that documents various horrors of the twentieth century. In many ways, it's tough to read for very long. But it's an important collection of scraps of witness that might have otherwise vanished. Once, we had two college students stay with us; they were part of a choir tour, and in that old-fashioned way, they stayed with church members wherever they went. I'll never forget the image I have of one of the girls devouring that anthology. She looked up at me, and said, "I didn't know that poetry like this existed." I wish that I had given that college student my copy of that book. I could have gotten another copy. But at the time, I was as jealously in love with that book as the student was. I wonder what kind of anthologies are still out there, waiting for poets to put them together. We need anthologies that people can't put down, that they compulsively read, trying to read as much of them as possible before moving on to the next choir stop. I once had an undergraduate professor who dismissed any poetry that ventured into the realms of the political. She asserted that a political poem couldn't be a good poem, a great poem. I disagreed with her, fervently, and I still do. The work of Carolyn Forche, both as poet and anthologist, prove my point. Today is the birthday of Mary Wollstonecraft, most famous for her Vindication of the Rights of Woman. I read about Wollstonecraft before I read her works, in an Eighteenth Century Literature class in undergraduate school. I read about how scandalized her society was by her writing, so I expected all sorts of radical ideas when I picked up her most famous book. I had a similar experience reading Karl Marx's The Communist Manifesto. I expected something radical and found something sensible. I kept waiting for the radical, society-disrupting ideas, and instead, read material that made me shrug. In the case of Wollstonecraft, her arguments seemed so obvious. Educate women, and they'll be better mothers. Educate women, and they'll be better wives, companions to their husbands rather than mere ornaments. Nothing too shocking there. Again, I am always conscious of how these arguments, which have become cornerstones of our educational system, are not widely accepted across the planet. I realize that I am lucky, because if I was born a woman elsewhere, I might never have been taught to read at all. I am also conscious of how this book was accepted at first, and then after William Godwin, the man with whom Mary Wollstonecraft had her most successful love relationship, published a rather sensational biography of her after her death. I want to believe that he did it in a grief-crazed moment of ill-considered decision making. I give Mary Wollstonecraft credit as an early feminist, a woman who helped begin the changes that have so transformed our world. First she advocated for the common man, and then used the same arguments to advocate for women. We've seen remarkable advances in human rights, and while there's still plenty of work left to be done, we come quite a remarkable way. It is also August Wilson's birthday. I've long been impressed with his project to write a play that would document the African-American experience during every decade in the twentieth century. When I first heard about his project, I was immediately drawn to the idea. Could a writer do the same for women? Would it have the same kind of import if it wasn't a play, but some other genre? Writing just one poem per decade doesn't seem enough. Could one write a poem cycle per decade? A chapbook per decade? I remember a year or two ago, when a group working with the Kennedy Center in Washington, D.C. gave a series of readings: each play, one per night, simply read by actors seated (I think) on the stage. It wasn't clear that this approach would be a success, even though the admission price was less than they'd pay for a play, with costumed actors and sets: would people really pay to have people read to them, as opposed to having the full theatrical experience? They did, and I felt cheered by that. Of course, Washington is a theatre town in a way that other cities aren't. Still, I think people are hungry for art, and not necessarily the high end kind. So, a poem cycle that represents each decade of the twentieth century as U.S. women experienced it. Hmm. Let me think on this one. Looking for Bishop Tutu in "In Our Own Words"
I got my contributor copy of In Our Own Words: A Generation Defining Itself this week. It's volume 8 in a series that explores what it means to be part of the generation born between 1960 and 1982. Much of my work has explored generational politics, so when I saw the call for submissions on Leslie Pietrzyk's blog site, I knew I had to submit. I had four poems chosen, but only 2 were finally published. That's cool; I feel lucky to have had two included. to let life flow through them again. away, drop by drop, never to be regained. would be still and silent before this man. tragedy into a lesson of God’s grace. 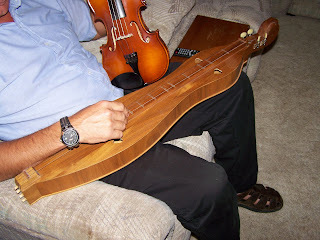 Here my spouse, Carl, introduces the new dulcimer to the old fiddle. I like this shot, the warm woods, the upholstered surfaces. Can he really play two instruments at once? Today we head to Secret Woods Park to a folk music jam. My first outing with my new instrument! Even though I can't play much yet, it will be cool. I've wanted a dulcimer for many years. I spent my adolescent years on both sides of the Blue Ridge (first in Charlottesville, Virginia, then in Knoxville, Tennessee), and my family spent a lot of time in those mountains camping, going to festivals, enjoying the culture. When I was young, a dulcimer seemed like an outrageous expense. 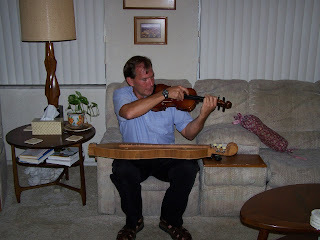 In 2005, my spouse and I started buying musical instruments, as if soon there would be a ban on new instruments. That time period corresponded with my mother-in-law's long, torturous death by American Medical Industrial Complex. I knew about Kubler-Ross's stages of death, but she never mentioned the musical instrument buying phase. I didn't buy a dulcimer then, because we live in South Florida, and the dulcimer is not a popular instrument here. And to be honest, my track record with buying an instrument and teaching myself to play is not good. My husband and I bought matching mandolins for our thirteenth wedding anniversary in 2003; yes, some women want diamonds for a present, but I prefer creativity prompters. One Christmas, my husband bought me a ream of paper in every color that Office Depot had. I thought that was the best present ever. Yes, I'm an office supply geek too. Anyway, we bought mandolins, and I had trouble right away. 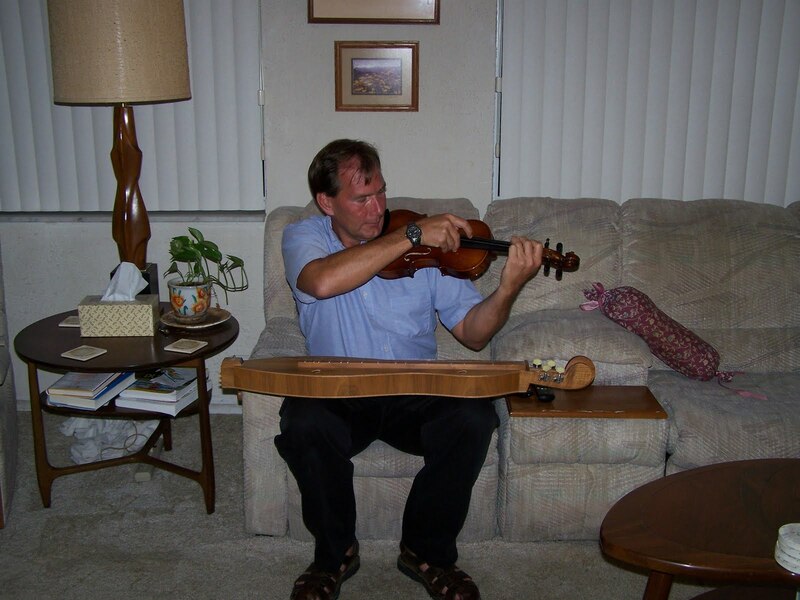 I couldn't tune the darn thing, while my husband, with his many years of violin lessons, took to the instrument right away. There I am, painfully plinking notes, and he's doing magical things with the instrument. I tried not to see it as a metaphor for our marriage. Through the years, I've gravitated to dulcimer players, during the rare times I've seen them. They've assured me that their instrument was easy to play. Meanwhile, my husband has returned to the violin, and he's really enjoying playing bluegrass and mountain music. I'd love for this to be an activity we can do together, but I can't learn the violin. Lately, I've been thinking about a dulcimer. It would go nicely with his fiddling. When we were near Asheville a few weeks ago, I made a half-hearted effort to find one, but none of the nearby music shops answered their phones. Earlier this week, back at sea level, I thought, I wonder what I might find on Craig's List. Low and behold, there was a dulcimer for $40. Last night, I bought it. I figure that if I really take to the instrument, I'll buy a better one later. This one has a lovely tone, even though it's not made out of the most exotic wood. We got it tuned and last night, we figured out which fret matches which musical note. By the end of the evening, I was able to pluck out a tune or two. Hurrah. 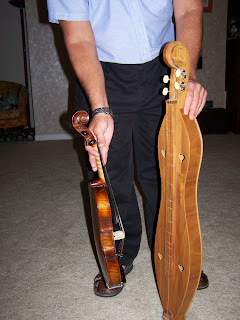 Tomorrow, I'll post some pictures of the violin and the dulcimer meeting each other. While I was at my creativity retreat, I led a workshop on spiritual journaling, and some of the practices we might use, even if we were less than committed to keeping a full-blown journal. We talked about gratitude journals, of course, and the simpler gratitude list, updated daily. This retreat happened two weeks ago, so I was entering the not-so-euphoric part of National Poetry Month, the part where my daily poem writing bogs down, and I'm grateful for haiku. Writing haiku always feels a bit like cheating, perhaps because I'm only writing haiku in the sense that I'm following the syllabics for each line. I'm not following the Japanese conventions any further than that. Still, I find them useful. It's good to think in such compressed form, even though I don't particularly like the haiku I write. I like the process. Two weeks ago, I started wondering, what if I wrote gratitude haiku? Would I come up with anything neat? Would the compression help or hurt? I want to feel expansive in my gratitude, after all. Let me give it a try. If I had written a gratitude haiku at the end of the day, what might it have said? I know that the title sounds British. It's Shakespeare's birthday, after all. If I was a good English major, I'd be writing sonnets today. I've got meetings scheduled today, so maybe instead of feeling irritation at the pointlessness of meetings, I'll write a sonnet. But first, a gratitude haiku! My soft bed and you. A roof that keeps out water. Today is Earth Day, of course. I'm reading Bill McKibben's compelling new book, Eaarth: Making a Life on a Tough New Planet, which argues that it's too late to save the planet; we've already changed our planet irrevocably, so we should learn to adjust to our new circumstances. Of course, we're new to this geological age, so it's hard to know how to adjust. I suspect that I should move further inland and upland. Or at least that I should buy some land elsewhere for that time when I'll have to flee the rising seas. But I can't even carve out time to grocery shop properly. How could I find a piece of land elsewhere? No, I'm a child of the 70's. I grew up watching Big, Blue Marble. When I was a child, you couldn't swim in many of the country's rivers--and they sometimes caught fire. Because of the changes sparked by that first Earth Day, now you can swim without too much fear. When I was a child, in major metropolitan areas, you could see the air you were breathing. Now, you can't. I won't post the whole thing, since it is unpublished elsewhere, and I want it to have wider publication than just my blog. In honor of Earth Day, I wrote a haiku. Well, I should clarify. It's a haiku only in that it follows the syllabic requirements per line: 5, 7, 5. I understand that the true form has other requirements, but I've left my notes from that haiku workshop in my office, so I can't list them here. Today is Charlotte Bronte's birthday. I've been haunted by Jane Eyre just about as long as I can remember. Yesterday, I was playing with a poem idea that I return to periodically. I needed to write 2 poems to catch up, so I wrote one called "Jesus Tweets." A poemesque thing in less than 140 characters. Then I remembered my idea about a to-do list of Jesus. I wrote an obvious entry: "Heal leper." Then a not so obvious one: "Heirloom seeds to Martha." Then I noticed 2 Hs, and my brain went wild. Could I write a 26 poem sequence? Could each poem be part of a larger abecedarian, which might be publishable as a chapbook? The first poem would be a to-do list of Jesus, with each entry starting with A. Next, B. And so on. Would it get trite quickly? Perhaps. Would the end result irritate readers? I have no idea. I want to think it would depend on what I wrote. But end result aside, it would be an interesting exercise. I've never started with a chapbook idea right from the beginning. I've usually written multitudes of poems and only gradually noticed a theme emerging. It cheers me to have this idea, and thus, I will do it. I will still continue to write my poem a day through the end of April though. I've gotten to the point where coming up with a poem a day is hard. I'm thinking wistfully back to the early days, when ideas flowed, and I felt like I had plenty of time to write them. This week is one of those slammed-for-time weeks. I seem to be having more and more of them. Sigh. Ah, we're almost to the home stretch of National Poetry Month, and I forgot to write a poem yesterday. As with many things, if I don't write the poem in the morning, I'm likely not to do it. It's the same with blogging, with exercise, with reading newspapers online. I need several mornings throughout the day. I once read a story about a man who tried to arrange his day that kind of way. He'd get up, write for a few hours, take a nap, get up, have another morning-like time, and so on, through the day. Alas, I don't have that kind of work life. So, I'll try to write 2 poems today to stay on top of things. Sigh. I am fascinated beyond reason by this Icelandic volcanic ash phenomena. I am not as interested in the air travel disruptions, although it is interesting to see how dependent we've all become on airplanes to move goods, not just people. No, I'm thinking in terms of the summer ahead. Will we have a cooler summer if the volcano keeps spewing ash? And if so, what will happen? Ideally, we'd just have a touch cooler weather, but wishing for a cooler summer is a gamble. I'm thinking of 1816, which came to be known as The Year Without a Summer; weather patterns were disrupted because of the eruption of Mt. Tambora in 1815. It was a year of catastrophic crop failures in Europe and North America (and likely Asia too, although I don't know as much about that side of the planet during the time period). This event became a major force in migration, as many people left the New England states and headed west, looking for better weather and more fertile land. I'd be happy with a cooler summer in South Florida, where our summer lows never dip below 85 degrees. At 4 in the morning, it's 85 degrees. Maybe we could have cooler evenings. What I really want is for our current weather to continue. What I really want is another passive hurricane season (year after year of them, please), but I doubt that atmospheric conditions have too much immediate effect on ocean temperatures. I'm also interested in the effect of weather on people's creative patterns. The Year Without a Summer drove people inside, including the group who had come to spend some time with Lord Byron at Lake Geneva. They issued writing challenges to keep themselves amused, and out of this came Mary Shelley's Frankenstein. I realize that our current Icelandic explosions aren't nearly large enough to affect the weather, the way they've affected air travel. But they could be large enough to affect our creative processes. As the ash settles to the ground, we could see spectacular sunrises and sunsets, the way the world did with the explosion of Mt. Krakatoa. In a recent piece in The New York Times, Simon Winchester notes the many artists influenced by the weirdly colored skies, including Munch. Winchester writes of other artists too: "An obscure Londoner named William Ascroft, astonished by the nightly light show along the Thames, turned out a watercolor every 10 minutes, night after night, working like a human camera. More than 500 Krakatoa paintings survive him. 'Blood afterglow,' he jotted down on one canvas, noting the magic done by refractive crystals of dust; 'Amber afterglow,' on another." It's like our poem-a-day process on steroids. I thought I was doing a great job writing one poem a day. Maybe I should try one poem every 10 minutes! I was in South Florida during the summer of 1999, a very wet summer. Month after month we broke rainfall records. It was one of the most prolific periods of my life. I taught an early morning Composition class, came home through streets that were already flooding, and sat in my chair, watching the rain, feeling cozy and writing poem after poem, and working on a novel and short stories. I submitted to every journal that took summer submissions, and when the fall submissions opened up, I had my envelopes stuffed, stamped, and ready to go. Of course, if the weather gets really severe, the impact on my writing life can be negative. During our disastrous hurricane season of 2005, I got very little written, and almost no submissions in the mail. I stored up lots of great images for later poems, which I've proven lucky enough and resilient enough to be able to write. I'm haunted by the experiences of people who survived Hurricane Katrina in New Orleans. I doubt I would have proven as resilient if I had faced the complete loss of my house along with my livelihood (many schools closed and never reopened, and I've always wondered what happened to all those workers). I also listen to the stories of volcanic ash and think about what metaphors I'll create. The ash is actually tiny particles of glass. I have glass on the brain too, because I knocked over a wine glass this morning and sent tiny shards of crystal spewing across my kitchen. Perhaps I'll start drinking my wine out of coffee mugs--they're much more resilient. When I was in undergraduate school, we spent a good deal of time studying William Wordsworth, but almost no time talking about William's sister, Dorothy. It wasn't until I got to grad school that I learned how instrumental Dorothy was to William's writing. And let me stress, I pieced it together on my own. I read Dorothy's journals and was struck by how much scut work she did: gardening, cooking, cleaning, washing. All that, and keeping a journal, and transcribing the poems of William and Coleridge. All those tasks and all that walking! I once calculated that their average daily walk was twelve miles. I have these thoughts this morning because The Writer's Almanac notes that today is the day in 1802 that Dorothy first commented on the daffodils that she saw in her journal. And later, William turns that journal entry into a poem. "When we were in the woods beyond Gowbarrow park we saw a few daffodils close to the water side. We fancied that the lake had floated the seeds ashore and that the little colony had so sprung up. But as we went along there were more and yet more and at last under the boughs of the trees, we saw that there was a long belt of them along the shore, about the breadth of a country turnpike road. I never saw daffodils so beautiful they grew among the mossy stones about and about them, some rested their heads upon these stones as on a pillow for weariness and the rest tossed and reeled and danced and seemed as if they verily laughed with the wind that blew upon them over the lake, they looked so gay ever glancing ever changing." William gives his wife Mary credit for these two lines: "They flash upon that inward eye / Which is the bliss of solitude." My inner angry feminist still can't forgive William for not giving Dorothy more credit. My middle-aged merciful self acknowledges how much the Grasmere household meant to Dorothy and that William never kicked out his sister, even as she became more difficult to live with. If you want a great book on the traditionally overlooked female compatriots of the earlier British Romantics, I highly recommend A Passionate Sisterhood: Women of the Wordsworth Circle by Kathleen Jones (St. Martin's, 2000). It's a wonderful book. It makes me both long to be part of that group and very happy to be a woman living in our current age. Dental care alone makes me happy to be a 21st century girl--not to mention tampons, oral contraceptives, antibiotics, laws that protect women, even though they don't go far enough and aren't enforced worldwide. I'm always deeply conscious that I'm lucky to live in the 21st century, but for all intents and purposes, most of the rest of the planet's women might as well be living in the nineteenth century. I'm part way through reading Her Fearful Symmetry by Audrey Niffenegger. I first heard Niffenegger talk about her book on an episode of the Diane Rehm show, but it's taken me awhile to get around to reading it. The book is due tomorrow, and I'm far enough along in the book to know I want to finish it (it's very imaginative, and I'm intrigued by the characters, and I can't predict where it's going, but I want to know), but not far enough to be able to finish it by tomorrow. What's the big deal? Why not just renew it? I have renewed it. Twice. So, I've had 6 weeks to read it, and I'm still not ready to return it. So, I must ask, is this book worth the late fines I'm going to rack up if I keep it out a few more days? In older days, I'd have said, "Sure. What's a dime or two?" But our library fees have gone up to a quarter a day. So, I could keep it through the week-end and make sure it's in the book drop Monday morning (I've been burned that way before, though). That would only be 50 cents, provided that I could finish. I never used to have this problem, finding time to read. Of course, I used to have a more flexible schedule, and more time by myself. I also used to have a slower Internet connection, so I didn't do as much online. What causes what? I'm happy to have a public library system, so I'm happy to pay taxes and the occasional fine. I'm also aware of how much less I'm using the library these days. Is it because I can afford to buy more books? Because I'm reading less? Because I hardly have time to go to the grocery store, much less the library? Again, some of all of the above. I'm trying not to despair too much. I tell myself that I will have time to read voraciously again at some point in the future. I try to react to my life the way that parents of toddlers must: I tell myself to enjoy the moment, that I can return to other activities I enjoy at some later point. But how I wish I had just a few more hours in the day! For now, I'll keep the book. Maybe the fines will prompt me to actually preserve some time to read offline. I'm back from my mountain top retreat, back with that surreal sense that it all went too quickly, and that I barely perceived I was there before it was time to leave. And then I returned to my daily life of endless e-mails and interesting interruptions. Yesterday, I looked up to see a young woman who said, "They told me you were the only one who could help me." This could be intriguing, I thought. Did she have a poetry question? A theology question? Something more mundane, like the location of a class or a teacher? Turns out, she had broken her shoe and wanted me to tell her Math teacher that she'd be late because she had to go home to get a new shoe. But I knew that once she drove to her home, which was at least a half hour drive if the traffic cooperated, and then drove back and then hunted down a parking place, she'd likely not make it to Math class. "Can't we fix your shoe?" I suggested. Her shoe was a flip flop kind of jeweled sandal, where the straps had come apart from the small stem that connects it to the sole. We looked at it together. We tried to fix it with some office supplies. I knew we needed a safety pin. Luckily, I had a friend nearby who has everything in her purse, from safety pins to band aids to bus fare to an extra pair of underwear and socks. She was happy to donate a safety pin, and with a few, decisive stabs, I fixed the shoe and sent the student on her way. I saw her a few hours later and the shoe was still holding together. Hurrah! We saved her a trip, some gas money, and perhaps her Math grade. Just a day in the life of an administrator--the kind of day that seems surreal in retrospect. My PhD in British Literature didn't really prepare me for this. Or did it? I'll spend some time thinking about the literature I read and think about how it prepared me for my current life--something pleasant to ponder during the next boring meeting. Or maybe I'll adopt my own secret slogan that will amuse me: What would Wordsworth say? Wordsworth would be appalled and tell me to get back to the mountain--but he'd also be appalled at the Super Wal-Mart that sprawls across the formerly pristine mountain top. When I was a kid, if you forgot to bring something with you to camp, you were stuck--there wasn't a place close to buy a replacement. Not now. So, Wordsworth would be appalled, just as he likely was in real life. But I suspect someone like Christina Rossetti or Elizabeth Barrett Browning would observe my life and smile; they would understand. And they, too, would have a band-aid or a safety pin to give me if I needed one. Just kidding--I did that last night, and I discovered what fisherfolk have always known. Fishing is a great excuse to stare into the surf, instead of staring at The Simpsons. We didn't catch anything, but we didn't expect to. I was simply trying to learn to cast, which will take me a long time, I suspect. My spouse, who is not as new to fishing as I am, may be able to actually catch a fish someday. If you fished when you were little, but haven't fished since, do you really have an advantage over someone who never fished at all? But I digress. 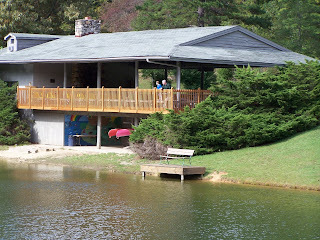 I'm headed away to the creativity retreat I go to every year at Lutheridge. Yes, while the rest of the poetry world heads to the AWP conference in Denver, I'm going to a different set of mountains, in North Carolina. The picture above is the lakehouse. Hopefully, my creative lake will be refreshed. I expect to return to regular blogging on Tuesday, April 13. Poem Published in "Big Muddy"
I just got my contributor copies of Big Muddy: A Journal of the Mississippi River Valley, where my poem, "Thanks Giving" appears. I'll paste it below. It's interesting to read this poem again and to think of its path to publication. I wrote it years ago, after what will probably be the last Thanksgiving at the old homeplace. My family on my grandfather's side (my mom's father) used to gather on the family land. It's still in the family, but the members that I remember most vividly, my grandfather and his siblings, have all passed on. I remember some of my mom's cousins, especially Cousin Barbara, who gave me rides to the airport and rescued us once when my boyfriend's car broke down. I treasure those stories that were told each Thanksgiving, stories of strong men and women, stories that have found their way into my poems and short stories. My favorite story is of a female relative who had a heart attack while picking the beans, but before she'd let them take her to the hospital, she insisted on changing into clean underwear. So, here's a poem that seems a better fit for Autumn, but maybe you'll find some Spring holiday appropriateness too. Finally, I am with my own kinsfolk. I do not feel a freak of nature anymore. I stare into faces familiar to me. of computers and office politics. before I plowed a field and put an addition on the house. to diet or exercise away. if only I would comply. But I’ll submit to my genetic destiny on some level. track the weather like a second religion. and share my good fortune with others. No, this is not my bunny cake, alas. This is the bunny cake that my mom made, that my mom, dad, sister, brother-in-law, and nephew got to eat. I should have thought ahead to make a bunny cake of my own. But I had a pretty good Easter even with the lack of bunny cake. One of the things that I enjoyed most was making Easter cards for Lutheran missionaries with the children (and a few adults) at my church during Easter morning breakfast. I also got a crash course in butterfly gardens when the children went outside to have an Easter egg hunt and a plant hunt (sort of like an Easter egg hunt, except they don't put anything in their baskets--it's a neat way to orient them to the garden). After a long, but happy, morning at church, we went home, changed clothes, and went over to our friends' house for a wonderful meal of lamb. Instead of bunny cake, we had caramel espresso cake. Yummmmm. Before it all began, I had a great early morning of writing (poem 4!) and working on tasks for the creativity retreat that's coming up; I'm one of the coordinators, and I expect to write more on that later. I love getting writing tasks done early in the day, in the same way I like getting exercise done early in the day. The rest of the day feels like a gift. Well, I've written my 4th poem, for day 4 of National Poetry Month. As always, on day 4, it's feeling easy. I'm surrounded by poems just waiting for me to write them down. Poetry ideas swirl in my head. I get up, I add a poem to my morning routine, I marvel at how easy it is. I wonder, why don't I just do this every day? It's the exact opposite of exercising, at least for me. When I go for a run (yes, I call it a run, even though you would call it a slow jog, or something less charitable), the first fifteen minutes are agony. Every muscle screams, "What the hell do you think you're doing? Stop. STOP. Stop right this minute. I mean it." And then I settle into a rhythm, my creaky body warms up, and I often sail through the rest. If this NaPoWriMo is like others, I will bog down mid-month. I will begin to feel a bit panicked, a bit like I can't possibly be expected to keep up this pace. I will worry about running out of ideas. But for now, I'm enjoying the ease. I'm enjoying the fact that I've prioritized. I've been listening to the soundtrack from Godspell, that old musical from the 70's that envisioned Jesus and the disciples as a group of clowns. I tend to hate most of the music that churches choose for Holy Week, and I try to use Godspell as an antidote. I think that Godspell was the first play I ever saw. We lived in Montgomery, Alabama, and we travelled to Atlanta with a group from our church to see the show. I was seven years old, and my mom tried to explain what we were going to see before the play started. I fell in love with the show then, and have loved it ever since. My poor parents had no idea what they were about to put into motion. Here were theological ideas set to a rock beat, songs that I could even sing. Here was Jesus, putting on little plays and skits. Here were people dressed not in their Sunday uncomfortable best, but in goofy clothes that I would never be allowed to wear to church. My enduring question for the next decade or two: why couldn’t weekly church services be more like Godspell? My parents, though surely this discussion wearied them, always tried to defend their faith, but they must have had one eye on the cults and strange religious trends sweeping the nation in those very strange, Jesus-soaked 1970's. They must have worried that I would leave the Lutheran liturgy and wander to strange places where they'd never see me again. Happily, I did not. I've often wondered if people who fall in love with Steven Schwartz via later shows like Wicked go back to discover Godspell and recoil. To me, it seems a natural trajectory, but I've followed the trajectory all along, so I'm not unbiased. My dad taped the soundtrack on a reel-to-reel tape recorder, and then made a cassette tape for my sister and me. Does anyone still use a reel-to-reel tape recorder? I remember working as a college d.j. in the mid-80's, and everyone was most impressed that I could work the reel-to-reel. By then, most tape was done by cassette, which had vanquished the 8 track. But think back to the 70's. Do you remember those pre-boom box cassette tape recorders? I remember falling asleep with the tape recorder softly crooning the Godspell soundtrack; the tape recorder was as big as a shoebox, and I curled my little body around it so it wouldn't bother my sister. Those songs have worked their way into my bones. As I listen to the soundtrack as a grown up, I'm pleased with how theologically sound they are, since they are permanently stitched into my memory. Once again, I'm reminded of how music helps us remember things. I always tell my students that if they want to memorize anything difficult, they should figure out a way to set it to music. Even the hymns that I love to hate this time of year work a similar magic. My spouse has been singing "The Old Rugged Cross" in a trembling bass voice, and I can sing right along. At least I like most Easter music, although the cantata that my church's choir (including my spouse) has been practicing is a little too pippy-poppy for me. How strange that I love the music of Godspell, which was criticized for being too rock-n-rolly in its day, but I dismiss the Easter cantata for something similar. Yes, I am officially old. So, here we are at the Saturday before Easter, when even the non-religious might celebrate by dying eggs and participating in other ancient pagan fertility rituals. At my house, we might grill some steaks and open some wine--after my spouse gets back from noon choir rehearsal, of course. I might go out and buy some art supplies or cloth--my annual creativity retreat approaches. Or maybe I'll get a heart rate monitor so that I can take my Spin classes to another level. Maybe I'll bake some hot cross buns (although I should have done that yesterday, for Good Friday). Or maybe I'll just enjoy an hour or two of quiet and sink into a book. The reward? We're entered into a drawing for free books if we play (see Kelli's blog for complete list of bloggers giving books away). I would create spots of sanctuary to leave throughout the world I would create. Some spots would be quiet and austere, while some would be festive parties. Some sanctuaries would have chocolate and fine wine, and some would have fresh fruit and water from deep springs. Some sanctuaries would have soft beds surrounded by pots of lavender and some would contain every book ever written. Every creature that I created afterwards would have a sanctuary designed just for their needs--but how would the creatures find the sanctuaries? I fell in love with this chunk of text as I was writing it, this vision of sanctuaries and I wanted to make sure I had access to it later, so I decided to post it here. Yup, it doesn't take someone with a degree in Psychology to peer into my psyche. Go ahead, peer. And you'll see even more sanctuary designs than you thought possible. Happy National Poetry Month! It's early here on the East Coast, Eastern Standard time. Perhaps I'm the first poet blogger to issue good wishes--that would be exciting. So, I wish for us all a month of more writing, more enjoyment of poetry, more sharing of the love of this art form. Many of us will be trying to write a poem each day, so if you're not writing, send positive energy our way. When I did it successfully a few years ago, I was amazed that I could do it. It taught me many lessons and left me changed, much the way I felt changed when I wrote my first villanelle. So join us--even if you don't write a poem a day, you'll write more than you would have otherwise. And you'll train your poetry brain to be on the lookout for inspiration. 14. How would you decorate your poetry scarlet letter? 16. Write a poem in which your favorite author from the past awakens to find herself/himself in our present time. Or write a poem in which your favorite author travels forward in time. 17. Write a poem that involves dough, stars, and an unusual car. 18. As you travel, eavesdrop. When you’ve collected several good quotes, weave them into a poem. 19. Open your backpack, your purse, your briefcase. What do you find there? 21. Go to your pile of poems that you’re just not sure what to do with. Choose one poem from each year of the last five or ten years (haven't been writing or saving drafts that long? use your own time frame). Choose a line from each. See what happens. 22. Take one or two of those lines, mix it with a line from a favorite poem of yours, take a phrase from your junk mail or television advertising, and see what happens. 23. Write a poem that’s 40 lines longer than the average length of poem that you write (feel free to take one of your older drafts, finished or not, and expand). 30. Stare at the sky for 10 minutes. Write a poem. Resolve that you will do more staring in the future: at flowers, at children, at stars, at the faces of those you love, at whatever brings you joy.